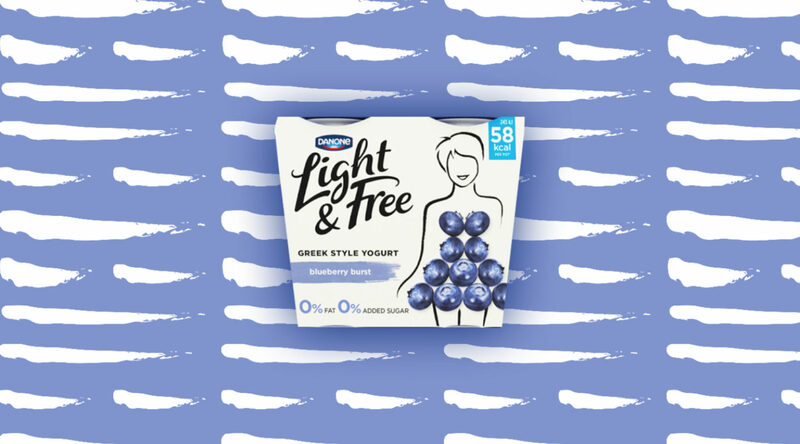 With Danone’s mission to bring healthy food to as many people as possible, they identified the opportunity to develop a truly great tasting Greek Style yogurt brand with real fruit pieces. 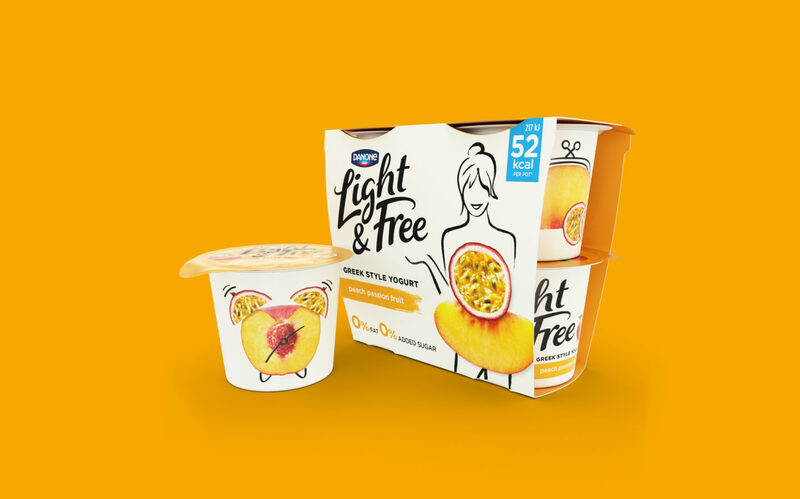 Aimed at young adults, Light & Free has over 30% fewer calories than most full fat fruit yogurts and is made with no added sugar and zero fat. It contains naturally occurring sugars to meet the needs of the health conscious target. 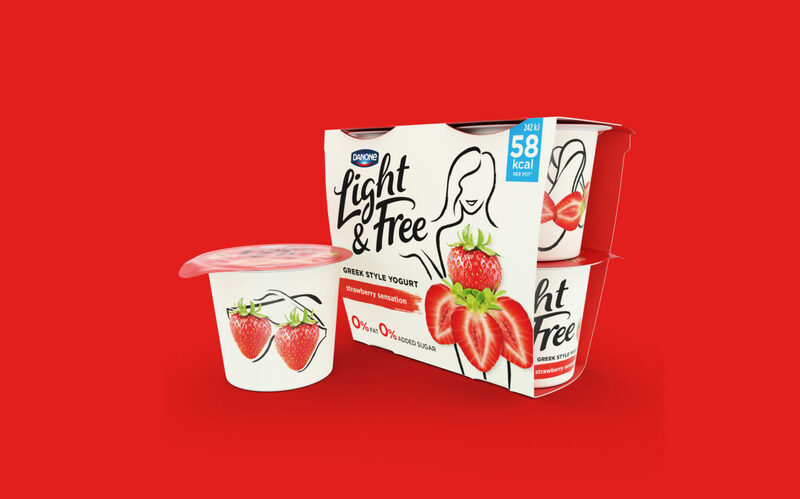 Danone approached us to help create the new brand. Building on the upbeat name Light & Free, we set about creating a joyful, dynamic and stylish look and feel, designed to achieve a distinctive presence in the yogurt chiller. 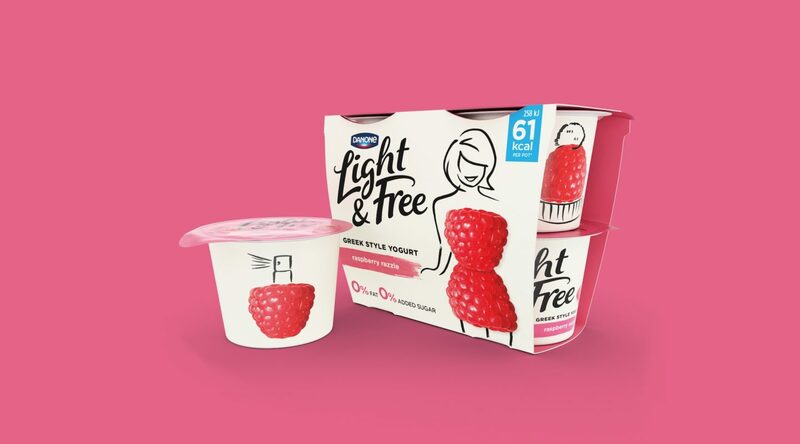 In a range of 5 enticing fruit flavours, with fun flavour names, like ‘Cherry Charmer’ and ‘Blueberry Burst’, the 4-pack sleeve design features light-hearted hand-crafted line drawings of stylish young women ‘wearing’ fruit dresses – breaking the usual yogurt category codes. 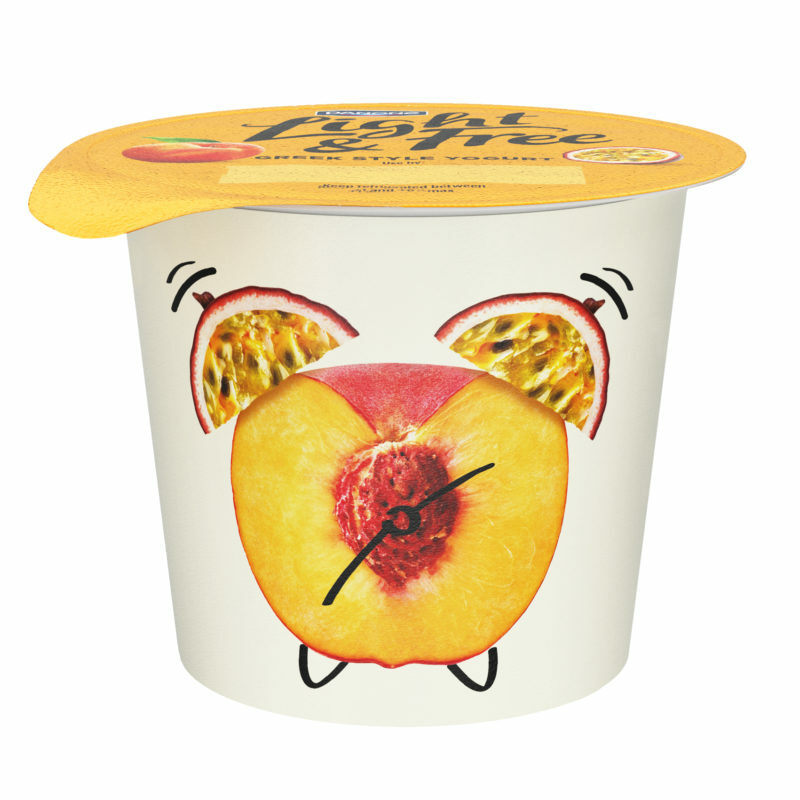 The individual pots are adorned with hand-drawn lifestyle-oriented accessories – based on music, sport and fashion connections – complemented by real fruit imagery to add appetite appeal, colour and a touch of humour. 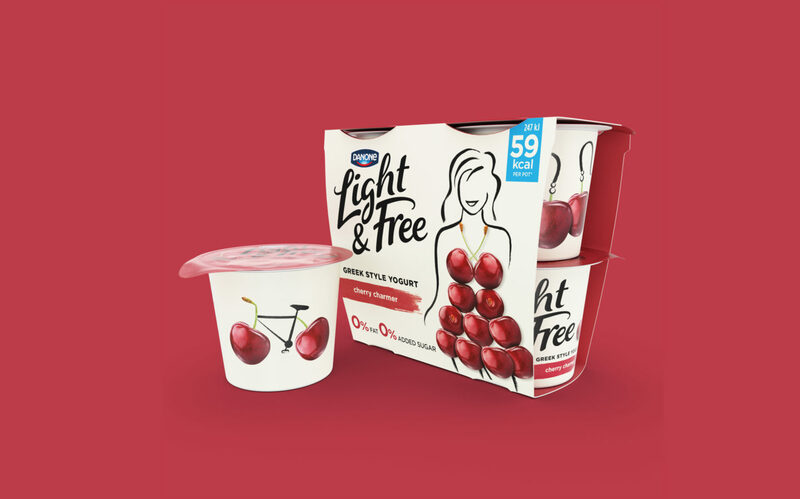 We needed to create a brand that looked beyond the usual confines of the yogurt category, and took inspiration from outside sources that spoke directly to millennial women. Exploring one of the key insights that Danone had discovered in their research – the desire to ‘feel good and look good’ – the design borrowed cues from fashion and young women’s lifestyles to make a bold statement in the chiller cabinet. 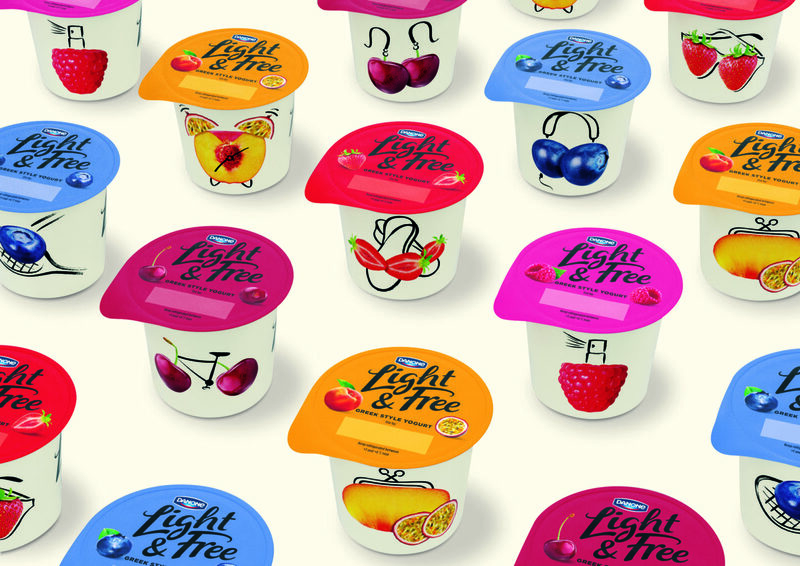 Light & Free was the biggest innovation in UK dairy in 2016, closing the year at £23m after launching in April. It was 30% above sales forecast within first five months. It was the biggest brand launch in 2016. It was the highest penetration of all yogurt innovation for the past 4 years.